A sari’s drape is nothing like a suit. A pin-striped jacket’s cut is far more slick. where ghagra, pallo, pleats might come undone. no midriff bare, distracting everyone. And yet, I’ll do my sari’s fall and bidding. I’ll worship, wear this comfort, live, enfolding. Roanna Gonsalves is the author of The Permanent Resident (UWAP), published in South Asia as Sunita De Souza Goes To Sydney (Speaking Tiger). Her book is the winner of the NSW Premier’s Literary Awards Multicultural Prize 2018, and was longlisted for the Dobbie Literary Award 2018. It is on several lists of must-read books, and on the syllabi of university courses. Her writing has been compared to that of Alice Munro and Jhumpa Lahiri. Roanna is a recipient of the Prime Minister’s Australia Asia Endeavour Award, co-founder and co-editor of Southern Crossings, and has a PhD from UNSW. She is the 2018 UNSW Copyright Agency Writer-in-Residence. 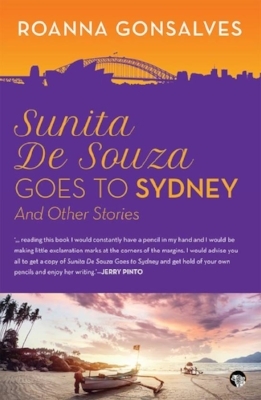 You can buy Sunita De Souza Goes to Sydney here.